18 Months Same As Cash - O.A.C. You'll Love Our Automatic Salt Delivery Service, Give Us A Try! Rain of Las Vegas has been manufacturing and installing water treatment systems since 1995. We provide the best water conditioning, reverse osmosis systems, water softeners and all repairs for the entire Las Vegas Valley. Our water treatment systems gives you soft, clean, healthy water for your whole house. All of our systems are custom built for the harsh water in the Las Vegas Valley and all of our systems are made in the USA. We have many options for soft water, conditioned water, filtered water and drinking water. There are no one size fits all solutions, so we build the right sized system based on your individual needs. We back every system with a generous warranty and outstanding customer service. We have over 75 years of combined experience in the water filtration business. Call us to learn more about our water conditioners 702-257-7873. Filter Changes Only $39 + Filters-Most Brands! Water bottle fill station in our Showroom – 20¢ per gallon. Rental Water Softeners Month to Month Agreement $39.95 per mo. 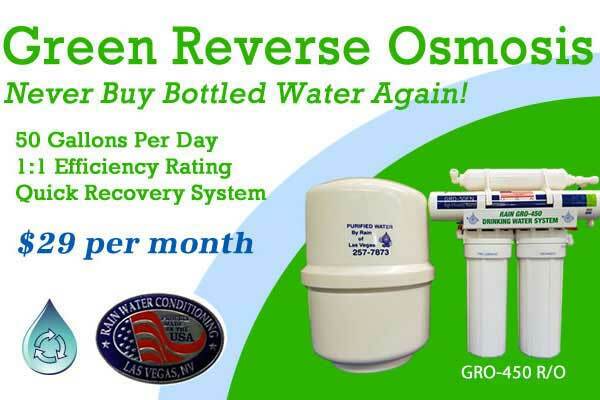 Rental Reverse Osmosis Month to Month Agreement $29.95 per mo. All of our new products are backed by our No Lemon Warranty. If there is a problem with your equipment, and we cannot repair it after 2 attempts, we replace it at no cost to you. (Good for 1 year) In over 24 years, we have only had to replace one system! Call (702) 257-7873 for more details! If you have had a great experience with Rain Water Conditioning please take the time to write a review on the social media sites below or on our review page. If you are considering our service, we hope the reviews are helpful. Thank you. Thank you for the review and we appreciate the opportunity to service you! Your best option is our whole house water conditioning system. This system gives you soft water and it removes the unwanted elements such as chlorine. Our water softener systems are built specifically to treat the hard water in Las Vegas. Start enjoying your water. Get great tasting drinking water with a Rain Water Conditioning Reverse Osmosis system. We welcome all repairs on any type of water treatment system.